When it comes to container gardening design, which should come first? Is it the container or the plants? It doesn’t really matter – all you need for a beautiful and successful container garden is the container, the plants, the right soil and water, and a certain amount of care and maintenance. Everything else comes down to you own creativity. Some times, I find a plant or flower that I just have to have – I have no idea where I’m going to put it or what I’m going to plant it in – I just know that I love its colors, foliage or something else about it. It “speaks” to me. Other times, I might be browsing – at my local greenhouse or garden center, through an antique store, or maybe at a flea market or a sale. I’ll find a great old bowl or pail or urn and I can see its possibilities as a flower planter. There are all kinds of containers to use in your gardening and they come in a wide variety of materials. But, no matter which way you approach your container gardening design – with the plants first, or the pot, there are some fundamental elements of design to consider. These are color, form and texture. Using one of them or a combination of two or three will help you create your best container garden. Color makes the biggest impact in your garden. It is the first thing that is noticed. Using vivid reds, oranges and yellows in your container garden design will always have a big impact, especially from a distance. Up close, pastels of pinks, purples and blues are beautiful. I am partial to the pinks and purples, so I use reds and yellows for impact and curb appeal in the front of my house, and use the pinks and purples on my back deck and patio where I spend more time. Certain colors work well in combinations. Red and green are complementary and so are yellow and violet, and orange and blue. Different shades of the same color family also work well. Violet and red-violet are harmonious, as are reds and oranges, blues and violets, and blues and greens. One color in container gardens can be quite effective. If you have a favorite color, try variations of that color to break up the garden and add definition. If purple is your number one color, buy plants that are lavender, lilac, mauve or pink. You will have a monochromatic garden that is anything but monotonous! And don’t forget that the green foliage on your plants will help add contrast as well. It has been proven that color can affect emotions. 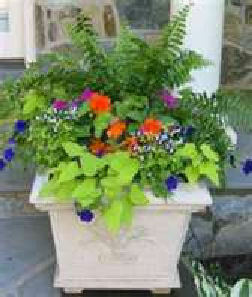 Color in container gardens can be used to promote excitement or it can be used to create a peaceful, calm surrounding. Maybe you like the vivid reds, yellow and oranges that make a bold statement and add high impact to your deck, patio, balcony or porch areas. If you entertain a lot, you might want to create a more festive look to your outside areas. If so, load up on those warm colored flowers and foliage. But if you are more laid back, or use your garden area for yoga, meditation, reading, or just relaxing, you might want to choose more serene color in your container gardens – blues, purples and pinks. 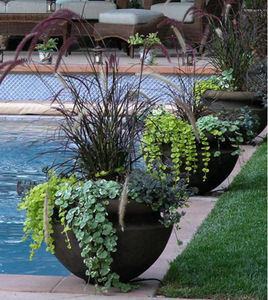 The use of form in your container garden design can make a significant impact. This is the 3-dimensional element of gardening. This includes the shape of the plants, their height and spread and whether they are airy or solid. You can use one type of form or a combination of two or three – it’s entirely up to you. Arching, spiky, mounding, uniform or trailing? Many ornamental grasses are arching. Spiky plants grow straight up. Salvia, lavender and cockscomb are a few you might want to try. Also, many grasses, succulents and cactus are spiky in structure also. Chrysanthemums are an example of mounding plants. 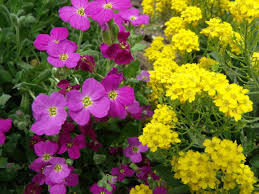 Geraniums and many annuals are uniform. Ivy is a trailing plant. Others to try are trailing fuchsia, verbena, petunias, lantana and nasturtiums. Flowers and foliage are also described as being open or airy, or solid. A fern with feathery fronds is considered open because you can look through the plant and see what is behind it. It is “airy”. 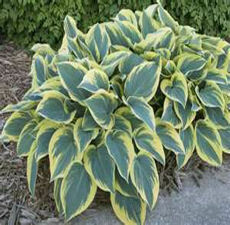 On the other hand, a hosta with its large, broad leaves is considered to be solid. 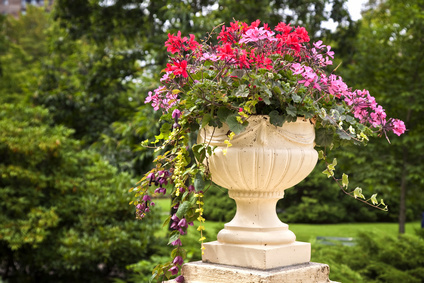 Arranging containers with structure in mind can create a classic, planned garden display. If you like a natural display, this may not be as important to you – play around with different flowers and foliage and see what type of garden you prefer. It is absolutely your choice. But whether you like traditional container garden designs, or a carefree, natural look, arrange your plants in your pot before you commit them to the soil. If you decide later that you want to change something, that’s the beauty of a container garden – pull it up, move it, or put it in another pot! 1. 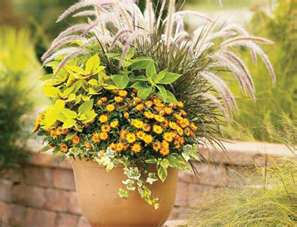 Start by placing a tall, spiky or arching plant in the center of the container. 2. Working from the center, plant mounding or compact plants around the tall plant. 3. Plant trailing plants along the outer edges of the container so they will spill down the sides. This works great for boxes too. And if you’re making a container garden to sit flat against a wall or in a corner, modify the plan by placing the tall, spiky or arching plant in the back, then work towards the front with the mounding flowers, and finish off with trailing plants in the front. The structure of this container gardening design delivers a clean, organized look. Achieve height in a container garden using ornamental grasses, tropicals like hibiscus, canna or elephants ear or architectural plants like yucca, agave or new Zealand flax.You can also use a trellis, garden stake or ornamental flag as your height. Blooms and leaves can be smooth, shiny, coarse or crinkled. They can be silky to the touch or rough. Flowers and leaves can be all sorts of different sizes and shapes. Try different types of textures in your containers to see what unique combinations you can design. Make your containers “touchy-feely”. When blooms fade, foliage with pretty or interesting leaves, form and feel can see your container garden areas through till the next blooms come on. 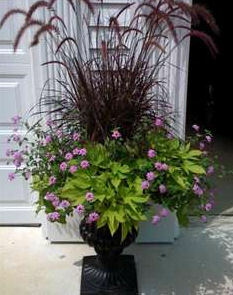 In the container here, when the blooms fade and are pinched back, the ornamental grass, green foliage and dark purple foliage will be a pretty display on their own. Texture plays an especially big part in container gardening design for shaded areas. There are fewer blooming plants for shade than there are for sun. Using plants with variations of roughness, silkiness, or form of leaf can help make up for the lack of color. Ferns and hostas are two fantastic choices because they come in so many shades, have many variations of leaf shapes and sizes, and range from fine or airy to coarse and crinkly. Try using coleus to add color. I’ve been using sweet potato vines too. Both are low maintenance and come in a myriad of colors. The combinations of color, form and texture are unlimited. 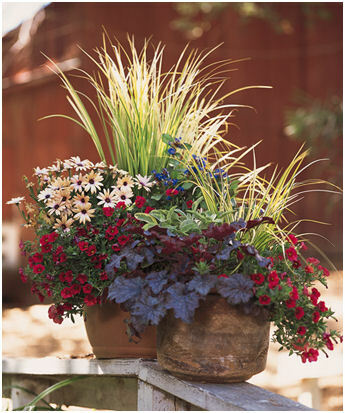 Find your favorite combinations for your container gardening design. Or, make containers of single plants and then group them to create your design. Just make sure when you combine plants, their needs for sun, water and soil are the same. This container successfully uses all 3 design elements. To find great plants in specific colors, structures or textures, visit the National Gardening Association’s Plant Finder at garden.org. You can search for plants according to all three elements and narrow them to your growing region. Play around with the Plant Finder. It is a great resource when looking for plants to include in your container gardening design.